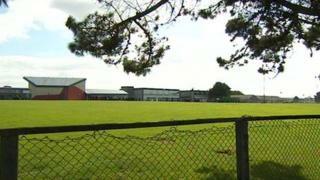 Plans for a Cornish school to sell off part of its playing fields to Tesco have been abandoned. Newquay Tretherras Academy had been in talks to sell land at the rear of the school in a bid to raise money to replace buildings. St Austell and Newquay MP Stephen Gilbert said the deal fell through because agreement could not be reached on the "finer details" of a contract. The school and Tesco said they were "disappointed" it fell through. Education Secretary Michael Gove had approved the sale in principle, which the school had said was necessary to raise money to replace buildings which dated back to the 1950s. Demonstrations were held against the plans, with objectors saying the sale would adversely affect the school's sporting facilities, as well as increase traffic and affect businesses in the area. Liberal Democrat Mr Gilbert said the sale was abandoned after the pair "were not able to reach an agreement on the finer details of a proposed contract, and further considerations on whether an effective highways solution could be delivered on the site". He added: "This proposal was always very controversial." Tretherras governors' chairwoman Sarah Karkeek said it had been "an incredibly tough decision to make". She said: "We are very disappointed that we have had to make this decision but it was one which was approved unanimously by our governors and, we believe, is the right one in the circumstances. "The key areas where the academy and Tesco were unable to agree concerned access routes to Newquay Tretherras, as well as the exact boundary point between the two proposed premises." Tesco's corporate affairs manager, James Wiggam, said: "We have been pleased to work with the school to discuss a potential scheme. "We understand there may be some disappointment a decision has been made not to sign a contract, but [we] know the school retains an exciting vision to improve their existing facilities." Olympics legacy: How can we encourage kids into sport?